Located halfway across the world from each other, four dedicated researchers felt the acute lack of well-researched science stories in their mother tongue, Bengali, and decided to come together to fill this gap. The outcome of their efforts - Bigyan.org.in - was launched on National Science Day, 2014, and in the last five years, it has grown and expanded into a concentrated effort to make science accessible to all. Here is the story of their journey. For a society that is awash in the fruits of scientific research, we are strangely aloof to the process of science itself. Scientists are partly responsible for this situation. There is a prevailing impression that they simply refuse to explain their esoteric research in terms that an outsider can follow. As a result, many initiatives have come up all over the world dedicated to bridging the gap between scientists and society. Since we started our journey in creating the platform bigyan.org.in, we have found many such efforts in Bengali as well. Some of them are almost solo efforts forged by a team of local science enthusiasts while others are efforts at a government level. Somewhere in the process of creating our website, we decided that the onus of communication fell on scientists themselves. If a person trained in science does not take up the responsibility of communicating his/her work, there is really no one else to blame when that science gets misrepresented or stays unrepresented in the media. We can understand that for many reasons, scientists are not always enthusiastic about communicating their research. The pleasure of doing science probably does not compare favourably with the challenge of explaining its value to a possibly uninterested audience. A researcher probably worries: is it worth investing the time to explain my work? Is there an audience for this? But that line of thinking is loaded with assumptions. Science is not inherently uninteresting, otherwise so many would have not pursued a career in it. We could perhaps understand a more reasonable assumption that science requires a long period of training before one really starts getting back some dividends. A large proportion of the audience probably would not have the training to appreciate scientific research. In the end, we in team Bigyan decided to challenge even that assumption. Unlike some countries in the developed world, most of us in India do go through a rigorous science curriculum. Some would say that so much information is squeezed into the space of four to six years (class VI to class XII) that one has little time to think about what it all means. We have the training, each and every one of us. If scientists chose to explain their work, they would find quite an appreciative audience. With this idea in mind, we started bigyan.org.in in Bengali in early 2014. We felt that a general awareness about science in the society must be spread in the language that most people are comfortable with. Further, there is no shortage of science outreach efforts in English worldwide, but there are very few in the vernacular. We wanted our effort to be sustainable, and clearly fill a void. There are many Bengali newspapers that publish stories on scientific discoveries with popular appeal. We agreed that competing with those newspapers on bringing the latest discovery first to the readership is not a meaningful use of our time. Often, such newspaper articles prioritize sensationalism over accuracy. They do convey the initial excitement of a discovery in broader terms (“scientists find a new cure for cancer”, “Einstein is proven right, once again” etc. ), which is, of course, valuable for creating scientific awareness. However, where they fail often is getting the science right. Writing an easily digestible article for a broad audience without making misleading and wrong statements requires a level of deeper understanding of the science itself. We often do not see this deep understanding in science articles published in Bengali newspapers. So, we asked ourselves the following question: “Let’s say that a reader gets excited by the news of the discovery of gravitational wave detection or a new cure for cancer from reading a newspaper article. Being inquisitive, she wants to understand, in simple terms, the underlying science. What can she read in her native language to gain this understanding?” There is a void between the popular stories published stories in newspapers and research articles. For instance, take the story of gravitational wave detection that broke in 2016. The bulk of articles on this story described gravitational waves in a somewhat superficial manner relying mostly on analogies. If you wanted to learn more, your only option was to pick up textbooks and launch yourself into a full-blown course in the general theory of relativity. It was difficult to find a simple explanation that began from something you learnt in school. This kind of gap is not easy to fill. Science popularization efforts worldwide (including that by IndiaBioscience) that bridge this gap effectively end up involving practicing scientists or journalists who have a strong research background. We took this route as well. Most of us in team Bigyan are in academia, so we started nudging our colleagues for articles. We tried to address the usual concern: do not worry about your topic of research being too esoteric. Whatever you write about — bacteria, evolution of peacocks, high-temperature superconductivity or quantum computing — as long as there is an underlying interesting story, we will publish it. And we have been overwhelmed by the response. We have started to think that the image of the scientist preferring to work in secret has many, many exceptions. Not only have scientists submitted articles at times explaining the nitty-gritty of their research or giving an introduction to their field, but a significant number of them have also stayed with us throughout our peer-review process and patiently answered our questions and addressed our objections. A word on the peer-review process: while common in the publishing of new scientific results, the peer review process is not common in popular science. At bigyan.org.in, we have adopted the peer review methodology to ensure the quality of our articles. The editorial team of bigyan.org.in seeks review from experts on submitted articles, focusing on both scientific accuracy and readability. To our delight, most authors, including eminent and senior researchers, have accepted our editing process wholeheartedly. As our collection of articles grew in number and variety, so did the readership. We received encouraging feedback from our readers - students and teachers in particular. 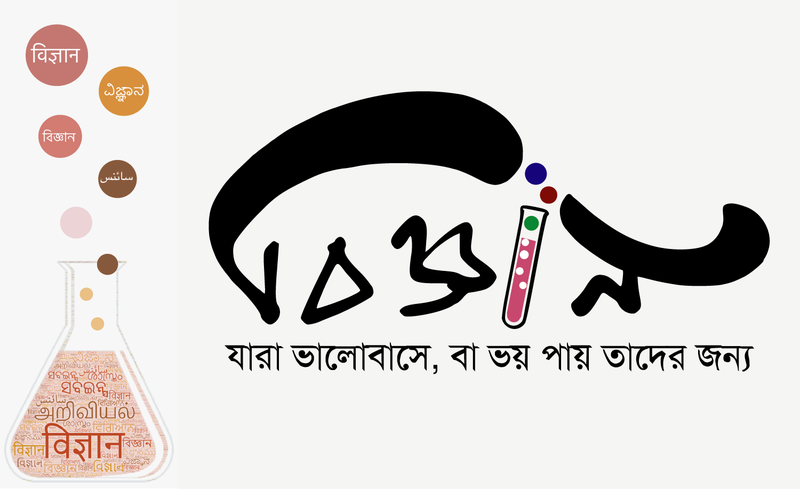 Soon, we realized that bigyan.org.in had become a platform of Bengali scientists worldwide who are passionate about science outreach. This network enabled us to take on projects that we did not envision at the beginning, such as distributing foldscopes to rural high schools of West Bengal (and a few in Bangladesh) with the help of our colleagues at Stanford University. 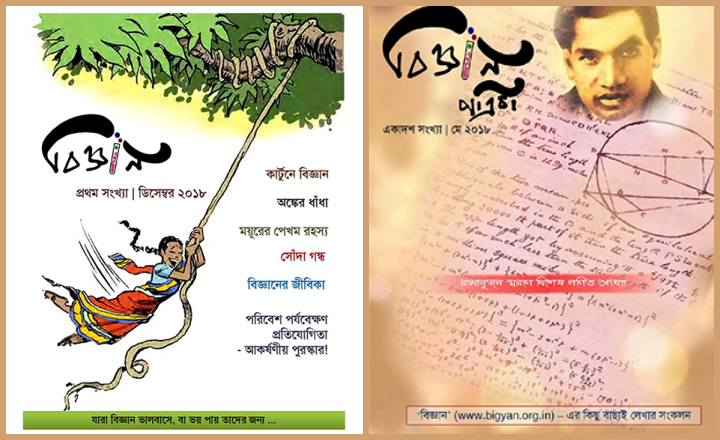 In 2018, we partnered with the Contai Science Academy (CSA), a non-profit organization comprised of high school and college teachers in Contai, West Bengal, to publish and distribute printed magazines to expand our reach beyond the internet. We are currently working with a few high schools (through CSA) on a pilot project on developing an enhanced learning environment in classrooms, where the teachers are incorporating new teaching materials and methodology to augment the textbooks. An example of the new teaching material is physics cartoons drawn by the world-famous cartoonist Larry Gonick, who has been working with one of the editors of bigyan.org.in on a US National Science Foundation project. An example of the new teaching methodology is the adoption of the ‘classroom response systems’ through cards, employed widely in many Western schools and colleges. Of course, there are many challenges to sustaining and further developing bigyan.org.in. Many authors, unfortunately, find it difficult to write in their native language. We need volunteers to translate their articles. The peer review process takes enormous time and effort. A large fraction of submitted articles come from authors who can be described as “experts in the subject matter but not-so-good writers”. Sometimes it takes many months to edit those articles. We need more practising scientists and people with strong scientific training and good writing skills to get involved with us. In an age of distractions and short attention span, it would help to resurrect many old high-quality articles (over 200 published in bigyan so far) from the internet graveyard in new formats, such as audio and video with attractive illustrations, to reach a wider audience. We need enthusiastic volunteers with technical know-how in graphics and illustrations and creative minds to succeed. But we are hopeful. As we discovered in our journey so far, there will always be like-minded people to extend helping hands! Did you enjoy this article? Do you know of other such efforts? Please let us know in the comments below.